Rubicon Express’ new Slip Yoke Eliminator Kit is designed to eliminate driveline vibrations while increasing the strength of your NP231 transfer case. When lifting your 87-06 Jeep, driveline vibrations are a common issue with the increased driveline angles. By converting to a fixed yoke, it allows for the use of a longer driveshaft with better operating angles to help eliminate vibrations. Each kit includes a replacement output housing, heavy duty main shaft, rear output yoke and all necessary hardware. 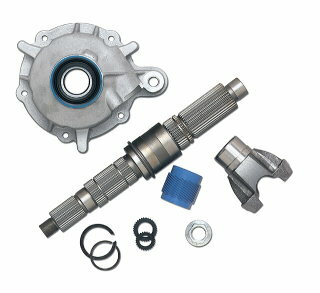 Note: Axle shims or adjustable control arms may be needed to properly set the pinion angle.